THE GIANT MATTERHORN forms a striking background to the Gornergrat Railway at the Riffelberg Station, 8,430 ft above sea-level. Between the railway and the mountain is the vast depth of the Gorner Gorge. All the smaller glaciers of the Matterhorn and Monte Rosa merge to form the great glacier in this gorge. MORE spectacular railway routes are crowded within the comparatively limited confines of the Alps, in all probability, than in any other area of comparable size in the world. There are the important main lines, which have been laid in all directions through this great mountain chain, and on which no expense has been spared in easing the gradients to provide for heavy and fast traffic. Of these the two most remarkable - the St. Gothard and the Lotschberg - have been fully described in the chapters beginning respectively on pages 139 and 1065 of this work. Then there are the minor lines, which have been carried through even more difficult country from the engineering point of view, but with steeper gradients, and, in some instances, with even more astonishing feats of engineering. Examples of these narrow-gauge systems are given in the chapter entitled “The Glacier Express”, beginning on page 493, which covers the metre-gauge main lines of the Visp-Zermatt, Furka-Oberalp, Rhaetian, and Bernina lines, extending in a chain for over 200 miles through the heart of the Alps. But there are various other Alpine railways which break records of one description and another, and which call for treatment. Among the short lines which make considerable ascents without the assistance of rack-and-pinion propulsion, is the Chur -Arosa Railway, connecting Coire, or Chur, the capital of the Grisons - Switzerland’s most easterly canton - with the high-lying resort of Arosa. This is but little more than a tramway, and the tramway illusion is heightened by the fact that the electric motor-coach, with its one or more trailers, starts in the roadway outside the main railway station of the Swiss Federal and the Rhaetian Railways at Coire, and proceeds through the streets of the town before entering the wooded slopes of the deep Schanfigg Valley. SOARING UPWARDS out of the Rhone Valley on the Martigny-Chatelard Railway. The gradient at the section in the above illustration is 1 in 5. Propulsion is by rack-and-pinion, and the line is electrically operated. It extends from Martigny to Vallorcine, on the French frontier, where it connects with a narrow-gauge branch of the PLM Railway leading to Chamonix in France. Climbing steadily, on an average gradient of 1 in 16½, the railway skirts slopes of ever-increasing steepness, and is carried dizzily across the ravines of the Castieler and the Calfreiser Tobel by steel viaducts, and across the Griindje Tobel by an even bigger ferro-concrete bridge, with tunnels through projecting spurs in between. But all these structures are completely dwarfed by the enormous arch on which the railway suddenly swings across from one side of the main valley to the other opposite the village of Langwies. By one clear span of 315 ft the track is carried 203 ft in altitude above the foaming Plessur, and it seems almost incredible, as this spidery structure is seen standing out dead white against its dark green background of pines, to realize that it has been executed entirely in reinforced concrete. 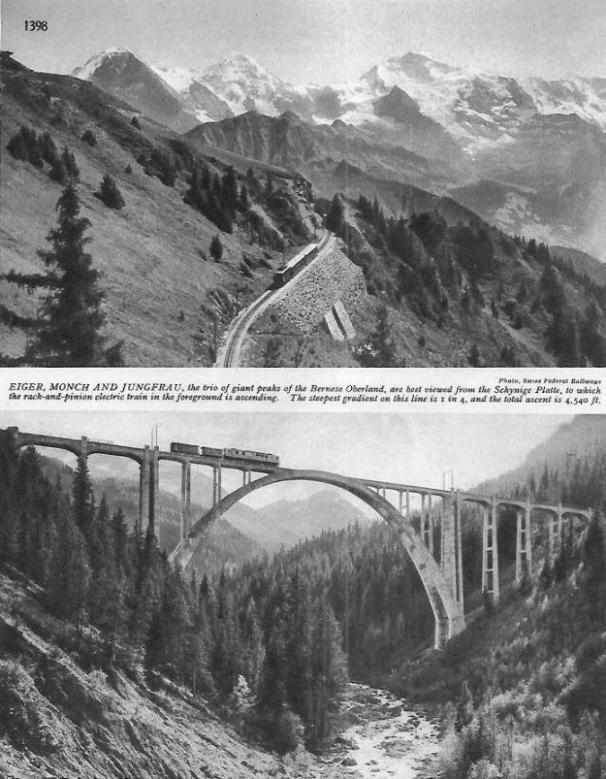 Yet, in laying what, after all, is in its scope not much more than a tramway, the Swiss engineers considered it worth while to carry out constructional work which is of the first engineering magnitude; for this is the biggest arch of its kind in Europe. The Chur-Arosa Railway has a total length of sixteen miles, and in its course lifts the train from 1,925 ft above the sea at Coire to 5,715 ft at Arosa terminus - a difference in level of 3,790 ft. The duration of the journey, stops included, is seventy-five to eighty minutes. Among the railways which employ both rack-and-pinion and adhesion working to negotiate abrupt and awkward differences in level, is a line which connects Martigny - a station on the Simplon main line in the Rhone valley - with Vallorcine, on the French frontier, where an end-on junction is made with the electrically-operated branch of the PLM Railway that has come up from St. Gervais through Chamonix and Argentiere. The Rhone, during past ages, has worn itself a valley of great depth and width. Most of the lateral valleys in this part of its watershed are at a considerably higher altitude than that of the river; their waters pour down to the Rhone either by way of enormous waterfalls, as with the Pissevache fall at Vernayaz, or through the deepest of gorges. Consequently any railway intended to establish communication between the main line and one of these lateral valleys has first of all to climb up the precipitous wall of the Rhone Valley. Leaving Martigny, the Martigny-Chatelard Railway, as it is known, travels first towards the north-west, alongside the Simplon main line, as far as Vernayaz, seeking the entrance to the Trient Valley, which is to carry it to the south. These first three miles, down the Rhone valley, are on the level. But then an arduous climb begins up the valley wall. The next station, Salvan, though only one and three-eighths miles away in a direct line, is at an altitude higher by 1,585 ft. By turning and twisting on the hillside, the railway requires over two miles to reach Salvan, but even then the maximum gradient required is 1 in 5, and the effect is well seen in the remarkable photograph of the electric motor-coach climbing towards a tunnel, which appears on page 1396. A distance of 2,477 metres (1·6 miles) is rack equipped, of which 1,914 metres (1·2 miles) are inclined at 1 in 5. From Salvan onwards the passenger over this highly spectacular route finds the train travelling along a kind of shelf, with mountains on his right and the deep Trient Gorge far below on the left. Between Le Tretien and the popular resort of Finhaut, with its magnificent view across the junction of two abysmal ravines at the Tete Noire, the line is carried on the extreme edge of a precipice, dropping 1,325 ft sheer to the Trient. 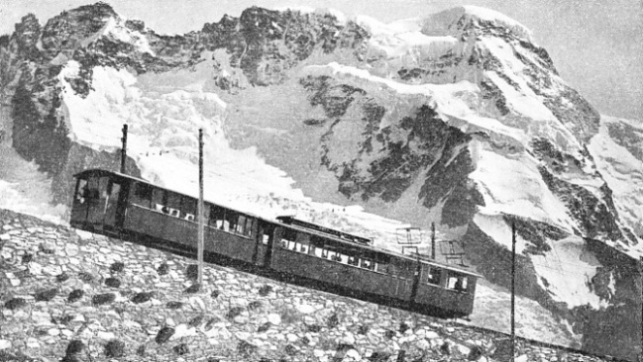 In the eight and a half miles between Vernayaz and Chatelard, the railway rises from 1,490 ft altitude at Vernayaz to 4,060 ft at Finhaut, and then falls again to 3,680 ft at Chatelard. From Martigny to the French frontier station of Vallorcine the distance is thirteen and a half miles. THE STEEPEST FUNICULAR IN EUROPE is that which carries passengers from Piotta, in the Canton Ticino of Switzerland, up to Piora Terminus, seen in this picture. The funicular is alongside the pipe-line of Piotta power-station, and was built to carry materials to the upper level. Rising 2,145 ft in less than a mile, the line has a maximum gradient of 88 per cent, or 1 in 1⅛. On the adhesion sections the steepest gradient is 1 in 14, and the average speed maintained is twelve and a half miles an hour, whereas on the 1 in 5 rack-and-pinion section the speed maintained is four and a half miles an hour. The motor-coaches employed weigh 38 tons each, and are able to tackle a trailer weighing 12 tons, making a total of 50 tons worked up and down an inclination of 1 in 5. The sharpest curves have a radius of only 200 ft on the adhesion sections, and 260 ft on those equipped with the rack. This short but remarkable railway affords a justly popular approach to the well-known resort of Chamonix, in Eastern France. Not far away to the west is the parallel valley of the Visp, up which there runs to Zermatt the electrically operated Visp-Zermatt Railway; this has already been briefly reviewed in describing the journey of the “Glacier Express”. Some further interesting operating records are created by this enterprising concern. Up the various rack-and-pinion sections, which total in length four and a half miles, and have a gradient varying from 1 in 13½ to 1 in 8, the electric locomotives, which weigh 46½ tons each and are driven by four 160 hp motors, giving a total horse-power of 640, can work trains of 65 tons weight at speeds varying between nine and twelve miles an hour. With maximum speeds up to twenty-eight miles per hour on the adhesion sections the whole journey of twenty-one and three-quarter miles from Visp to Zermatt, climbing 3,103 ft, and with seven intermediate stops, is completed in one hour thirty-five minutes, at an average speed of thirteen and three-quarter miles an hour. Such careful attention has been paid to lightening the weight of the rolling stock by welding instead of riveting, and by the use of aluminium for various purposes, that a train of three corridor bogie coaches, seating ten first - class, forty - eight second-class, and seventy-eight third-class passengers in the utmost comfort, weighs empty only 55 tons. 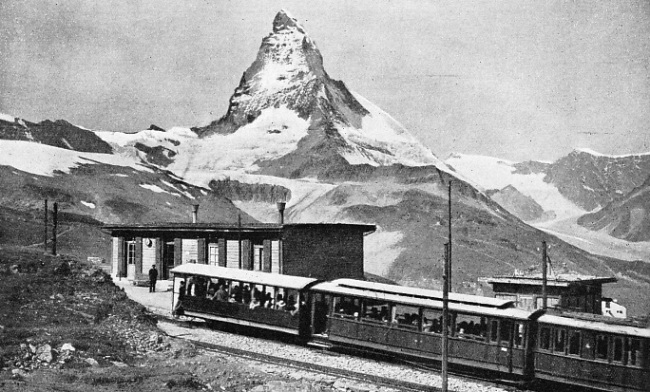 But the railway journey need not end at Zermatt, for by means of the Gornergrat Railway the passenger may mount yet another 4,920 ft in altitude to the Gomergrat, where the railway terminus is 10,235 ft above the sea. This unique station offers one of the finest glacier views in the world. Immediately opposite the observer, and at close quarters, there stand in line the ice-mantled summits of Monte Rosa, the Lyskamm, the Breithorn, and, farther to the west, the great granite pyramid of the Matterhorn. Between the rocky ridge of the Gornergrat and these peaks there flows the enormous Gorner Glacier, in a long, sinuous curve. Draining into it, in the manner of vast frozen waterfalls, are all the glaciers which come streaming down from various parts of the great range. In every other direction the view is completely unobstructed, and ice and snow, dominated by one Alpine peak after another, make an unbroken chain round the horizon. Though not attaining by a thousand feet to the maximum altitude of the Jungfrau line, the Gornergrat Railway earns no small distinction by being, with the exception of one short tunnel, in the open air, so that views are obtained throughout the journey as well as from the summit. There are two intermediate stations, at Riffelalp and Riffelberg, each of which boasts a large hotel, and there is another at the Kulm, or summit, which is, of course, the highest open-air railway station in Europe. The principal engineering feature of note is the steel viaduct by which the railway is carried across the Findelen Gorge, high above the river. handling a capacious trailer car. The time taken for the complete journey of six miles is seventy minutes, stops included. Another well-known group of mountain railways in the heart of Switzerland is based on the celebrated resort of Interlaken, in the Bernese Oberland. Of these, the Jungfrau Railway, whose upper terminus, at Jungfraujoch, 11,342 ft above sea-level, is the highest railway station in Europe, is described in the chapter “The Conquest of the Clouds”, which begins on page 11 of this work. But the lower terminus, at Kleine Scheidegg, is itself 6,770 ft above the sea, and in its turn cannot be reached except by mountain railway transit from lower levels. On any fine summer’s day the joint station of the Jungfrau and the Wengernalp Railways at the Scheidegg is as busy as a junction in a large town. The Wengernalp line climbs to this mountain pass from either side. From the north-east there comes the section from Grindelwald, which has mounted 3,660 ft in a journey of five and a quarter miles, with rack-and-pinion propulsion throughout. The ascent is made below the north face of the Eiger, which towers 10,000 ft above Grindelwald, and more than 6,000 ft of the face is a sheer precipice over-shadowing the line. From Interlaken trains of the Bernese Oberland Railway run to Grindelwald, twelve miles away. For most of the distance, partly with ordinary adhesion working, and partly with the help of rack-and-pinion, the line is carried up the deep valley of the Black Liitschine, alongside the foaming torrent of the river, which at Zweiliitschinen is joined by the White Liitschine. This pours out of an even more abysmal valley, with perpendicular rock walls in places from 1,000 to 1,500 ft. high, up which also a branch of the same railway has been carried to Lauterbrunnen, seven and a half miles from Interlaken. In winter no sign of the sun is seen at Lauterbrunnen until 11 am. It would seem at first sight that no railway could possibly be carried up out of this valley, but the engineers of the Wengernalp Railway have found one sloping break in the continuity of the cliffs on the east side. Up this, looped to and fro on a forty-five degree slope and with a gradient of 1 in 5, the railway rapidly mounts, partly in the open and partly in tunnel, to Wengen. This village, 1,570 ft above Lauterbrunnen, gloriously situated on, a sunny terrace which commands both the abyss of the Lauterbrunnen Valley and the magnificent amphitheatre of snow mountains at its head, is two and a quarter miles by rail from Lauterbrunnen. From Wengen the climb continues, first across the pastures high above the Lauterbrunnen Valley, and then turning eastwards into the Trummel Valley, with rack-and-pinion propulsion all the way, until it reaches the Scheidegg, there joining the branch which has come up from Grindelwald. The distance from Interlaken to Jungfraujoch is exactly twenty miles, the journey requiring the services of three railways and lifting the traveller roughly 9,500 ft. The most attractive excursion from Interlaken is to ascend to Jungfraujoch by this route, and to return from the Scheidegg to Interlaken by way of Grindelwald, thus completing a circuit of unparalleled scenic attraction. 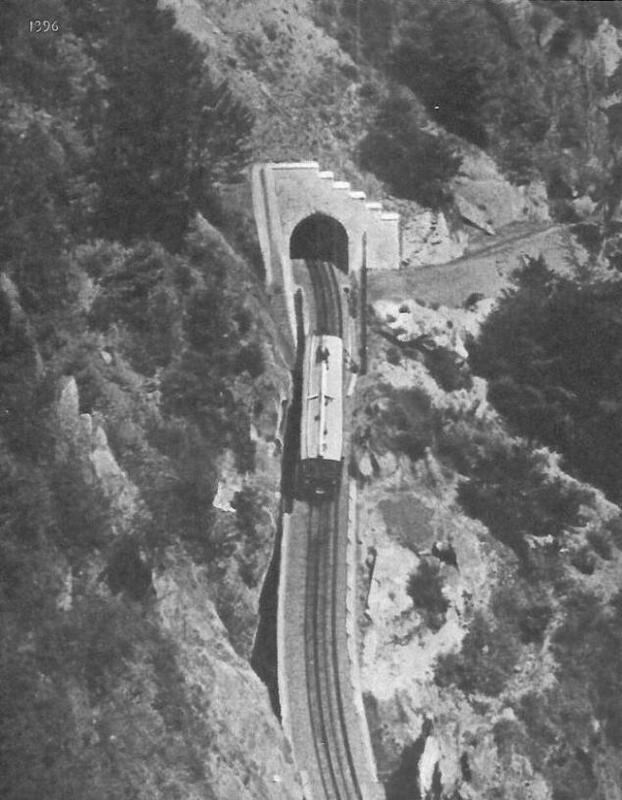 A COLOSSAL ARCH OF 350 FT. SPAN across the Plessur Valley at Langweis, on the Chur-Arosa line. This is the largest ferro-concrete arch span of its kind in Europe. The railway that it carries 203 ft above the torrent serves the well-known resort of Arosa in the Grisons, 5,715 ft above sea-level. Also belonging to and worked by the Bernese Oberland Company is the rack-and-pinion line diverging at Wilderswil, two miles out of Interlaken, and climbing 4,540 ft in a journey of four and a half miles to Schynige Platte. This electrically-worked railway, which is seen in the illustration on page 1398, has a maximum gradient of 1 in 4, and makes accessible what is probably the finest of all views of the Bernese Alps, and in particular the Wetterhorn, Schreckhorn, Eiger, Monch, and Jungfrau. Yet another railway in this vicinity is the cable-worked funicular rising dizzily out of Lauterbrunnen - with a gradient of 55 per cent - on the west side of the valley to Grutsch Alp, 2,275 ft above, whence an electric tramway, three and a quarter miles long, with a superb view across the Lauterbrunnen chasm of the Jungfrau group, carries the tourist to the popular resort of Miirren. Miirren, too, has its own cable-worked funicular, 589 yards long, which climbs nearly another thousand feet to Allmendhubel, 6,360 ft above the sea. All these lines are at their busiest in the winter sports season, when they receive much patronage from skiers and other sports enthusiasts. Reference has been made in earlier chapters to cable-operated Alpine railways, which carry sightseers up to many of the best-known viewpoints in Switzerland. But the steepest of these lines have yet to be described. The record is probably held by the line which mounts from Piotta, in the Canton Ticino, to Piora. This soars upward in a gradient which finally steepens to 87·8 per cent or roughly 1 in 1⅛. In a journey of 1,510 yards or seven-eighths of a mile, the passenger is lifted 2,145 ft. The journey time is twenty-four minutes. Adjacent to the railway is the great pipe-line of the Piotta power-station, which generates current for the southern half of the St. Gothard main line. 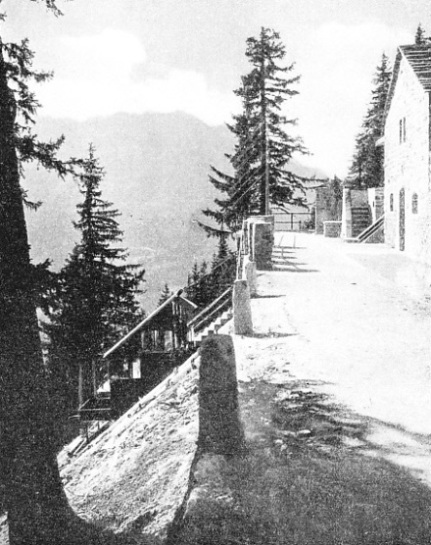 The funicular was originally constructed to carry the materials up to the upper level for the construction of the barrage works on Lake Ritom, from which the water supply for this hydro-electric scheme is drawn. A similar funicular runs up from the station at Chatelard village, on the Martigny-Chatelard Railway already described, alongside the pipeline coming down from the great Barberine barrage; the latter cable-worked line rivals the Piotta-Piora Railway with a maximum gradient of 87 per cent. Still more terrifying in its inclination is a contractor’s funicular up which the writer travelled - in an open wagon without sides - to see yet another vast barrage scheme in course of construction in the south of Switzerland, to serve the new Chandolin power-station at Sion. This last funicular has a maximum gradient of 108 per cent - one in seven-eighths - and for the effect that it has on the traveller’s nerves, it might well be vertical. But this is too remote from civilization to be turned to any subsequent passenger uses, and on the completion of the barrage will probably be dismantled. Nevertheless, it is pertinent to remark here that, no matter how hazardous some of these airy Alpine ascents may appear at first sight, no traveller on a Swiss mountain railway need entertain any fears for his personal safety. 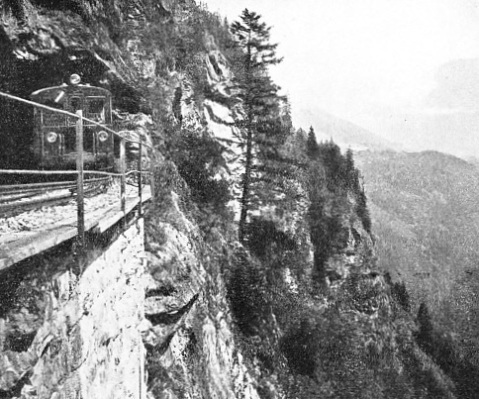 In the whole history of the purely mountain railways of Switzerland, not one single passenger has ever lost his life as the result of an accident. This immunity is all the more remarkable when the spectacular routes of the Swiss mountain railways are taken into consideration. Switzerland is entitled to congratulate herself on so fine a record of safe working in such extraordinary conditions. At regular intervals each Swiss mountain line is subject to inspection by a representative of the Federal Government, who has power to order any replacements of material or alterations in working that he may deem necessary in the interests of continued safety. 1,325 ft deep, with the Trient torrent foaming below. Of all the Swiss cable-worked funiculars the one which gives the most rapid transit to a high altitude is the line up the Niesen. As seen from the Lake of Thun, the south side of which it dominates, the Niesen is an almost perfect cone, rising to an altitude of 7,762 ft, whereas the lake is only 1,840 ft above the sea. Because of its isolated position, the Niesen offers a panorama over the mountains of the Bernese Oberland, and far away across the plain of the Aar to the great rampart of the Jura, that is almost unrivalled in its extent. The lower terminus of the Niesen Railway is at Miilenen-Aeschi, a station of the Lotschberg main line between Spiez and Kandersteg, and 2,273 ft above-sea-level. From here the funicular extends for 3,850 yds, at first through woods and then on the open mountainside, to the upper station, which is 7,664 ft above the sea. The difference in level between lower and upper terminals is thus 5,391 ft, and the time of thirty-five minutes taken on the journey includes three minutes for changing cars at the intermediate station of Schwandegg, 5,479 ft up. The construction of the line in two sections both obviates the use of a haulage cable over two miles long, which would have been necessary had the ascent been made in one stage, and also doubles the carrying capacity of the railway. Each of the four cars, two of which are used on either section, passing each other at the half-way point, has four compartments, and accommodates thirty-two passengers seated, and four more on the end platform. The maximum steepness of the ascent is 68 per cent, or a fraction steeper than 1 in 1½. The average speed of 4·1 miles per hour, and the travelling time of thirty-two minutes in conquering a difference in level of all but 500 ft, probably represents the world’s record speed for a line of such inclination. In the matter of suspension railways, or telepheriques, as they are known in the Alps, descriptions have been given of various examples in earlier chapters, but the most startling of them all has yet to be mentioned. To discover it we need to cross the frontier from Switzerland into France, and make our way to the popular resort of Chamonix, in the deep valley of the Arve, dominated by the great chain of Mont Blanc on the south side of the valley. The oldest mountain railway here is the steam-worked Montanvert line, which ascends 2,977 ft to a point overlooking the Mer de Glace. But of more recent years the builders of suspension railways have been busy running these lines in various directions up the mountains round Chamonix, chiefly with the object of affording to sightseers better views of the mountain mass of Mont Blanc and its outlying peaks - known as Aiguilles - than can be obtained from the bottom of the valley. 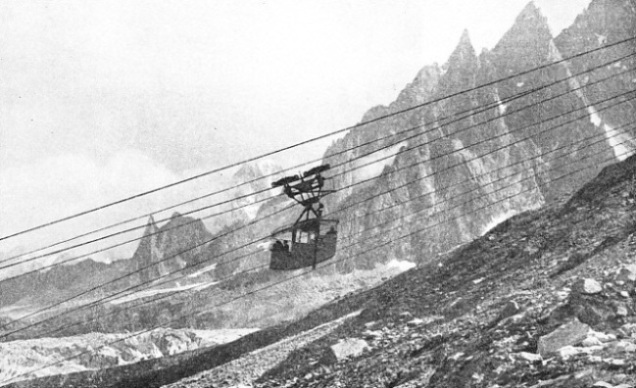 The first of the telepheriques from Chamonix boldly attacked the Mont Blanc range itself, and was opened in 1924. It has been carried up the flank of the Aiguille du Midi as far as Les Glaciers; the lower terminus is 3,455 ft above sea-level, and the upper 8,740 ft. The ascent of 5,295 ft is broken intermediately by a change of cars at La Para. But the ultimate intention, if finances permit, is to continue with a third stage, from Les Glaciers right up to the proud crest of the Aiguille du Midi, at no less than 12,610 ft above sea-level. If this project is ever carried out, this will be, by a handsome margin, the highest railway of any description in the Alps, overtopping the Jungfraujoch terminus of the Jungfrau Railway by 1,268 ft.
On the opposite side of the valley the suspension railway builders first carried a line up the lower slopes of the Brevent until they reached a shelf on the mountain-side, known as Planpraz, from which is obtained a renowned view of Mont Blanc, across the yawning depth of the Chamonix Valley. This line is 1,870 ft in length, and rises 2,950 ft, with an inclination which in parts reaches 80 per cent or 1 in 1¼j. Each of its main cables, of 2½ inches diameter, weighs 28¾ tons, and has a breaking strength of 275 tons; the passenger cars accommodate twenty-eight people. But on reaching Planpraz the sightseer still finds himself more than 1,500 ft below the summit of the Brevent. Furthermore, the face of that mountain is a sheer cliff over 1,000 ft high, and between the two there is a valley of considerable depth. Nothing daunted, however, the French engineers have swung cables across this enormous gap, and the suspension railway from Planpraz to the Brevent is now in being. For additional security and also for the purpose of lightening the weight of each individual cable, the main supporting cables are doubled; the breaking strength of the pair, each of 1-in diameter, is 126 tons. The passenger car is of very small dimensions, and accommodates fifteen persons, all standing. This telepherique is popular, and on summer days the cars go up with full complements at less than fifteen-minute intervals. CLIMBING FROM ZERMATT TO GORNERGRAT. The entire six miles of the electrically-operated railway are in the open, affording unbroken views of incomparable beauty. The railway is open only during the summer, and, for part of its length, during the winter sports season. It climbs to a height of 4,920 ft above Zermatt, reaching an ultimate altitude of 10,235 ft above sea-level. You can read more on “The Glacier Express”, “The Great St Gothard”, “Power Production in the Alps” and “Through the Bernese Alps” in Railway Wonders of the World.